Sophie Simmons, daughter of Gene Simmons and Shannon Tweed, began her career starring in Family Jewels on A&E, which aired for six years in 90 different countries and solidified her presence as a household name. She can currently be seen as the host of Refinery 29’s Body Image School digital series and as the face of Adore Me’s “all women campaign” (showing women how the lingerie looks on all sizes of women) – a community she has become a prominent voice for. Sophie has taken a multifaceted approach to entertainment, and made a name for herself outside of her rock and roll roots. Through music, TV, film, digital, and outreach, Sophie has establishing herself as an artist, actress, model, host, and activist. Especially close to her heart is music, which she started in at a young age. She wrote her first song at the age of five and since then has been writing and performing as much she can, including audiences as large as 20,000. In late 2015, she was featured on a Republic Records release of Rebel’s cover of the 90s classic “Kiss Me”,”which went to #1 on Spotify in 9 countries and currently has 8.3 million streams on Spotify alone. Sophie is currently working on new music with the likes of Dave Aude, Yellow Claw and many more, with plans for a 2017 release. Sophie also established Sophie’s Place – A Child Advocacy Center – dedicated to supporting children who are victims of physical, mental, or sexual abuse. Sophie’s goal is to impact and connect people through everything she does. She treasures the connections that can be made through authentic human experiences and hopes that her work will both reflect and inspire such. Los Angeles, CA – Country comes to town when the new musical Country Crush is released on DVD on March 14 by Shout! Factory, available exclusively at Walmart. 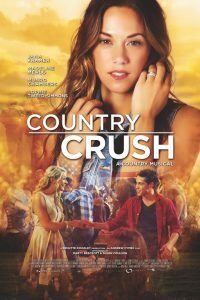 Starring Jana Kramer, a finalist on last season’s Dancing With The Stars following the release of her latest chart-topping album 31, Madeline Merlo, currently touring in support of her album Free Soul, Munro Chambers, known for Degrassi: The Next Generation, and Sophie Tweed Simmons, as seen on Gene Simmons Family Jewels, this is a classic love story with contemporary themes and hot country music performances.